Moira Cameron is a Yeoman Warder of the Tower of London, England. She is the first woman to ever hold the position. In 2007, after a 22-year career in the British Army, Cameron became one of the 35 resident Warders in the Tower of London, commonly known as the Beefeaters. Originally prison guards, the Yeoman Warder's position dates back to 1485. It is now a largely ceremonial role, with responsibility for conducting guided tours and generally looking after public visitors to the Tower, as well as conducting certain other duties both inside and outside the Tower. Cameron joined the Women's Royal Army Corps (WRAC) in June 1985 at the age of 20. She was trained as a Data Telegraphist with the Royal Corps of Signals before transferring to the Royal Army Pay Corps (RAPC) in 1988 to train as a Military Accountant, and in 2000 Cameron was awarded her Long Service and Good Conduct Medal. In 1992, WRAC and RAPC were replaced by the Adjutant General's Corps, and Cameron worked her way through the ranks in its Staff and Personnel Support Branch, completing 22 years service in the army in June 2007. Having seen service in England, Northern Ireland and Cyprus, Cameron ended her Army career at the rank of Warrant Officer Class 2, holding the post of Superintendent Clerk in 145 (Home Counties) Brigade in Aldershot. Cameron officially became the first ever female Yeoman Warder in July 2007 but didn't get to wear her uniform until 3 September 2007. Cameron is one of 37 Yeoman Warders based in the Tower of London, a position which dates back to 1485. Styled as Yeoman Warder Cameron, her full and proper title is Yeoman Warder of Her Majesty's Royal Palace and Fortress the Tower of London, and Members of the Sovereign's Body Guard of the Yeoman Guard in the Extraordinary. 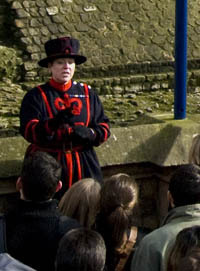 Camerons' duties are mostly connected to the Tower, but can involve some outside ceremonies. Within the Tower, Cameron's role is to take care of public visitors to the Tower and perform guided tours, guard the Crown Jewels, perform the Ceremony of the Keys and look after the Ravens of the Tower. Outside the Tower, Warders duties are to attend the Coronation of the Sovereign, lying-in-state, the Lord Mayor's Show, and other state and charity functions. As a Yeoman Warder, Cameron has two tailored to fit uniforms, the Scarlet ceremonial dress, and the 'undress' blue uniform for day-to-day duties. On 25 November 2009, two Yeoman Warders were dismissed after being found guilty of gross misconduct for bullying Cameron due to her gender. Three Warders had been suspended, and one was subsequently re-instated following the month-long investigation, with his role 'unproven'. One of the three also received a police caution for defacing Cameron's Wikipedia biography. The post of Yeoman Warder had never specifically been barred to women, although due to the rules governing women in the British Army, it was only in the modern era that women were able to have a career able to meet the entry requirements. To apply for the job, applicants had to be aged between 40 and 55, have completed at least 22 years' service in either the Army, Royal Air Force or Royal Marines reaching the rank of Warrant Officer or Senior Non-Commissioned Officer (NCO), and have been awarded the Long Service and Good Conduct Medal. It was announced on 3 January 2007 that an unnamed female would be replacing a retiring Yeoman Warder in September 2007, with WO2 Cameron, still in the Army at the time, publicly named as this replacement eight days later. Cameron had long been interested in the job of Yeoman Warder, and applied to an advert placed in Soldier Magazine in Summer 2006. Cameron was not the first woman to apply for the job of Yeoman Warder, but she was the first to pass the interview process, beating five male candidates for the vacancy. Born in 1964, Cameron grew up in Furnace, Argyll on the west coast of Scotland, and joined the Army at the suggestion of her mother, who thought she 'needed to see the world'. As part of her job as a Yeoman Warder, she lives in the Tower of London in a subsidised apartment. In February 2011, Cameron was made a patron of The Kit Wilson Trust for Animal Welfare, an animal welfare charity based in East Sussex. ^ a b c d e "Biography, Warrant Officer Class 2, Moira Cameron". Historic Royal Palaces. n.d. Archived from the original (pdf) on 25 November 2009. Retrieved 25 November 2009. ^ "Beefeater makes history at Tower". BBC News. 3 September 2007. Archived from the original on 25 November 2009. Retrieved 25 November 2009. ^ a b "First female Beefeater starts at the Tower". Reuters. 3 September 2007. Archived from the original on 25 November 2009. Retrieved 25 November 2009. ^ a b c d e f g h "Warder with a secret weapon". Historic Royal Palaces. n.d. Archived from the original (pdf) on 25 November 2009. Retrieved 25 November 2009. ^ a b c d e f g h i "First ever female Beefeater is appointed at the Tower of London". www.mod.uk - Defence News. Ministry of Defence. 11 January 2007. Archived from the original on 5 February 2007. Retrieved 25 November 2009. ^ "Beefeaters in harassment inquiry". BBC News. 2 November 2009. Archived from the original on 25 November 2009. Retrieved 25 November 2009. ^ "Beefeaters fired in bully probe". BBC News. 25 November 2009. Archived from the original on 25 November 2009. Retrieved 25 November 2009. ^ "Female Beefeater to guard Tower". BBC News. 3 January 2007. Archived from the original on 25 November 2009. Retrieved 25 November 2009. ^ "Female beefeater goes on parade". BBC News. 11 January 2007. Archived from the original on 25 November 2009. Retrieved 25 November 2009. This page was last edited on 12 November 2018, at 15:33 (UTC).